Committing suicide is an extremely grave and fateful spiritual crime. 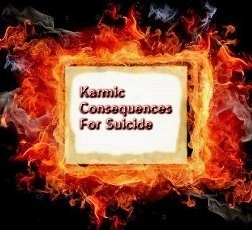 Dim minded people who foolishly hope by ending their life to get away from the miserable burdens of their bad karma have another thing coming; suicide multiplies their karmic burdens by fueling it instead of removing it. Those individuals who have left their bodies in a state of sin as with those who foolishly and ruthlessly committed suicide are thought of as tainted souls in the astral spheres. Imprisoned in their astral bodies they grieve the loss of their earthly life and find no rest and therefore must roam in the lower astral planes grieving the loss of their physical embodiment; hating to be reborn for the very reasons they have taken their own lives. These pitiful souls have to wander around in the ether until they have worn out the karmic effects of their bad actions; many of them were very unscrupulous during their time on earth. Those condemned for breaking the cosmic laws are sent to the penitentiary of suffering from wrong actions. It is impossible to escape from the tribunal of cosmic laws which video tape and govern every single human action (the unseen controllers) until we all have worked out and fully paid our karmic bills through reformation, suffering or prayers for deliverance. Such an individual was Judas who betrayed Jesus then repented his evil karma by hanging himself with overwhelming guilt. He did repent but that did not free him from his monstrous sins of betrayal and suicide. For his betrayal he had to wander through a multitude of incarnations to achieve his redemption. After twenty centuries of roaming Judas was finally redeemed by one of India’s great saints. His sin has been paid, were the words given to the modern day saint by Jesus who decisively sanctioned his release. Turiyananda spoke of this on several occasions, and said he often prayed for those who had “suicided.” Turiyananda said that when someone commits suicide, they are saying that they don’t want to live anymore. So God has to Consequences reawaken the desire for life, and the process takes about seven incarnations. The first lifetime after the suicide is very short, maybe an abortion or a death during childbirth. The next life is a little longer, and the next a little longer still. Gradually, the soul gets used to living in a body again, and dislikes being thrown out by death just when things were getting interesting. Finally, the person is brought face to face with a situation similar to the one that caused him to commit suicide in the first place. We must pass all of God’s tests. Your good and evil actions are freely chosen, yet when one has acted there are no longer any free choices to the consequences. Still, you have the freedom before you act, however the results from that action will be with you whether you like it or not. From the teachings of Paramahansa Yogananda.